Wealthy Affiliate Review: Is It The Best Way To Learn Affiliate Marketing Today? If you’ve ever searched for ways to make money online (who hasn’t? ), you can bet there’s one strategy you’ll find in every list. At its core, affiliate marketing consists of selling other people’s products—whether that be physical or digital—in return for a commission. 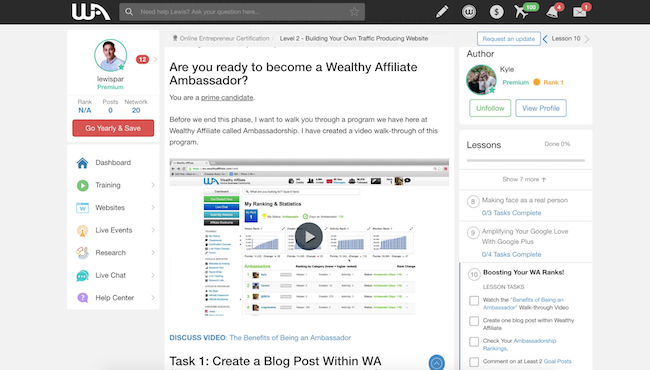 Wealthy Affiliate is one of most well known training platforms and communities for learning affiliate marketing. If you’re looking to get started as an affiliate marketer, then it’s definitely worth a look. And while there’s a lot to be said about selling your own products, some affiliate marketers have been able to build 7-figure businesses largely off the back of other people’s products instead. So how do you master affiliate marketing? Well, in this review, we’ll be looking at Wealthy Affiliate; a platform designed to give you everything you need to become a successful affiliate marketer from the ground up. Here’s what we will be covering in this Wealthy Affiliate review. What are some of my favorite parts of Wealthy Affiliate? What I don’t like about Wealthy Affiliate? Wealthy Affiliate is a popular online training platform and community that helps people learn affiliate marketing. It was started back in 2005 by Kyle and Carson and they have developed Wealthy Affiliate into a huge community of 1.5 million marketers and entrepreneurs. The community is what makes Wealthy Affiliate unique, and combined with the training and tools, can help you get started on your path to creating your own successful online business. What Are Some Of My Favorite Things About Wealthy Affiliate? As mentioned above, Wealthy Affiliate is a very community-centric platform, and that’s a big part of what makes it so valuable. I talk more about the community aspect later in the review, but I wanted to highlight just how powerful this is for a learning environment. While most of these lessons are already very detailed, it’s natural to have questions along the way — especially if you’re a beginner. Scrolling down, you’ll see questions from every other member with answers directly from other, more experienced members and sometimes even the founders of Wealthy Affiliate. These discussions often have hundreds of responses covering every possible roadblock you can imagine. This is the power of community driven learning and it’s easily one of my favourite things about Wealthy Affiliate as a whole. Yep, you get a free WordPress website with your Wealthy Affiliate membership. Once installed, you can go ahead and set up your theme, plugins and pages/posts just as you would with any other WordPress site. Like any hosting service, Wealthy Affiliate does impose some limitations such as the number of sites, bandwidth usage and disk space. I’m sure you’ll agree these are still very fair, and anyone who manages to surpass the limits will have a rather successful website on their hands. Building your online affiliate empire would be difficult without the right tools to guide you along. Fortunately, Wealthy Affiliate integrates with a well known market research software called Jaaxy, unlocking many of their premium research tools at no extra cost. These tools can be accessed from your Wealthy Affiliate dashboard and aim to complement the step-by-step training. They can be used for everything from finding a niche, uncovering profitable keywords, discovering trends in the market, and locating relevant affiliate programs. This is somewhat of a counter-argument to the good points above, but it needs to be said. If you build your business on the web hosting and research tools that come with your Wealthy Affiliate membership, you WILL need to continue paying in order to keep those benefits. For example, if you decide that you no longer get enough value from your Wealthy Affiliate subscription, you’ll need to migrate your website to another host before you can cancel. The same goes for any of the research tools you’re using since migrating those could mean registering with multiple other services in order to maintain the same functionality. This might sound obvious but it’s easily overlooked and something that can come back to bite you later if you ever decide to leave. After signing up to Wealthy Affiliate you’ll be able to start using the platform without any upfront payment. My guess is that Wealthy Affiliate decided to limit what they give away for free to those who are more likely to become paying customers, which excludes most developing countries such as Vietnam, where I am now. So if that affects you, you unfortunately won’t be able to test run this platform before going ahead with a paid plan. It’s all or nothing. Either way, one you do sign up you’ll get a cheesy animation of all the additional account benefits opening up. This page will also include some getting started steps such as watching a welcome video, reading the welcome message, and writing a blog post about your new upgraded account. From here, you can click the dashboard link to go to your account home screen. This is where most of the action happens and you can keep up with other members via a Facebook-like feed. Speaking of Facebook, let’s talk about the social dynamic of this platform. If you didn’t catch it from the screenshot above, Wealthy Affiliate feels very community-driven from the moment you log in. In fact, one of the first things you’re encouraged to to do upon becoming a member is set up your public profile so you can start to engage with other members on a more personal level. You’ll also see public messages from other members about their progress, as well as posts from people who need to overcome specific hurdles. You can create a longer post in the form of a blog entry, or you can simply submit sentence in the form of a question post. Regardless of which type you choose, I found the community super engaged with almost every post in my feed. You’ll also find a live chat feed on the right side of the page which can be used for more light-hearted interaction with other members. And yes, you can even follow (and be followed) by other members like a true social media platform. I’m a huge fan of this approach with any online learning environment, but this is especially important for a platform where most of the members have never even made a cent online. Being in like-minded circles and seeing real people get real, tangible results is what keeps you going, and it’s no doubt a smart play for a recurring membership site. A fundamental part of the Wealthy Affiliate program is focused on the educational aspect of affiliate marketing. While the fundamentals of online marketing tend to stay the same over time, it’s the tactics that often need revising. Fortunately, Wealthy Affiliate training is regularly updated to reflect any industry changes. For me, considering that Wealthy Affiliate markets itself as a platform for marketers of all experience levels (including beginners), the training has to be thorough and progressive in nature. As you can see, it looks a lot like a typical online course and that’s exactly what it feels like as you navigate through this interface. Fortunately there’s a clear progression system in place, and each of the levels represent a series of lessons that you have to go through in order to fully understand the next one. If you look at the individual lessons, you’ll quickly learn that the whole concept of this training to help you build a content-driven business before monetizing with affiliate links. Side note: Going into this platform I was a little worried about what kind of stuff was being taught as there are a LOT of spammy tactics around affiliate marketing. Fortunately, it’s all based on long-term, white-hat methods. Each lesson consist mostly of text with a few videos where necessary, and some of these lessons can be anywhere from 500 words to 2,000 words long. As someone who prefers video-based courses, I felt a little overwhelmed by the amount of reading involved in order to go through everything. Of course, whether that’s an issue or not will depend on your preferred method of learning, but it’s certainly something I’d want to know before shelling out for membership. The lessons I’ve highlighted here are part of the main certification course, and there are other courses available. As much as I wanted to get mad about affiliates making money by showing other people how to become affiliates, I quickly realized that this training is still delivering on its promise — to help you make money as an affiliate. I mean, they even have an affiliate dashboard built into the platform that incentivizes members to take this approach. Honestly, I can’t help but respect the strategy. It’s beautiful. Before I wrap up this section, I’ll just quickly cover another aspect of the training area called ‘Training HQ’. I couldn’t find any description or documentation of how this differs from the core training, but it appears to be a collection of user-submitted content. These include countless courses, webinar replays and even just one-off videos, but they all tie into growing an online business for the purpose of affiliate marketing. Overall, I think the level of training you get from Wealthy Affiliate is well worth the investment of the membership alone, especially if you’re starting from scratch and have no knowledge of running an online business. I was really surprised to see website hosting as part of Wealthy Affiliate because hosting is a pretty hefty expense to take on from a business perspective. So let’s see if this is the real deal. From the ‘Website’ menu item, you’ll find various options when it comes to setting up or managing your site. After choosing a theme, Wealthy Affiliate will take a few seconds to set everything up, as well as provide you with a username and password to log into your site area. This couldn’t be further from the theme I selected, but like most WordPress themes, they never look anything like the demo without a bit of work upfront. As for the backend, everything looks and functions as you would expect with a typical WordPress installation. As I began configuring my website, I quickly realized that the theme I was using is actually a free WordPress theme that’s not related to Wealthy Affiliate. In fact, the theme was pretty aggressive about getting me to upgrade to the pro version in order to get the full benefits. Considering I was under the impression that these themes were built by Wealthy Affiliate, I honestly felt a little cheated. And just to be clear, I have nothing against free themes. I’ve seen blogs grow to a respectable size without paying a cent on themes. It’s just that the re-skinned theme library was misleading. That aside, you do get all the power of WordPress as part of your Wealthy Affiliate subscription, and that’s certainly nothing to cry about. Going back to the previous menu, you also get a few custom tools such as a writing platform, comment manager and support module. While these functions are available within WordPress either as part of the core or as free plugins, it’s a nice touch for non-techies. For example, the writing tool is a little more user-friendly than the standard WordPress editor, and it syncs up nicely with WordPress. Overall, this is a decent solution for setting up your website and it could easily save you a few hundred bucks a year. So far you’ve seen an active community-driven platform with a myriad of learning resources and an inclusive website builder. That’s already an impressive offering, but let’s not forget about those killer market research tools you get access to as a Wealthy Affiliate member. As I said at the start of the review, these tools are part of the Jaaxy suite, which is a separate, third-party service that compliments the core training found within Wealthy Affiliate program. Jaaxy Pro would normally set you back $49/month, but Wealthy Affiliate includes a limited version of this plan (called “Lite”) at no extra cost. I won’t go over every Jaaxy feature since that could be a review in itself, and you’ll find plenty of dedicated reviews with a quick Google Search. What I will do, however, is a highlight a couple of the primary tools from the suite to give you an idea of what you can expect. The first is the Keyword tool. This works like any traditional keyword research tool. Simply plug in one or more seed keywords and it will generate a list of similar keywords for you to analyze. Unlike Google Keyword Planner and a handful of other keyword tools, this one gives you precise search volumes and additional insights such as the QSR and KQI scores, giving you an idea of how difficult it will be to rank in Google. The other one is the Site Rank tool. This shows you where your site ranks across major search engines for specific keywords, and you can track those keywords daily. Now, while these are great examples of the utility of having access to the Jaaxy suite, I’d be lying if I said they were all amazing tools. For example, the Affiliate programs tool. This one allows you to scrape a few of the popular affiliate websites for relevant affiliate offers. While it’s nice to be able to switch between these sites, it’s still something that’s readily available for free by going direct, not to mention having access to more up-to-date listings. Overall, these research tools are useful additions to Wealthy Affiliate, and while they may not be industry leading they are plenty good enough when it comes to building successful affiliate sites. This is one of the few products I’ve reviewed that has support baked into the core concept of the product itself. As I’ve said a few times throughout this review, community is a HUGE part of the value you get from becoming a member. If you’re ever stuck, a quick submission to the public forum will net you a flurry of helpful responses from like-minded marketers. Also not forgetting the live chat option which plugs you straight into an instant messaging feed for quicker response. This can be accessed from the ‘Live Chat’ menu item. You also have the private messaging system that encourages direct interaction between members. While you don’t see the more traditional support options here, like a ticketing system or phone support, personally, I feel this level of community-driven support will always be superior. Wealthy Affiliate has a relatively simple pricing scheme. To start you can see what the program is all about by signing up for the Starter package. It’s quite limited by the fact you only get access to Phase 1 of the Affiliate Bootcamp training and you only get 7 days of live help. If you want to get the most out of the Wealthy Affiliate, then you’ll want to upgrade to their Premium package which is $49 a month. You basically get access to everything the training program has to offer, plus you get a 2x higher payout if you want to promote it as an affiliate. All in all, I was pretty impressed with what Wealthy Affiliate has to offer. I know many people who struggle with getting started with online marketing, and being part of a friendly and knowledgeable community is a great way to get some small wins and start making your first dollars online. Sure, you can learn about online marketing by yourself by reading blogs and going in on your own. But there’s so much information out there to filter through. Wealthy Affiliate teaches you what’s working right now, and that’s super valuable. If you want to join some of the world’s top affiliate marketers, then definitely check out Wealthy Affiliate.